Entry forms with payment must be received by May 15. The entry fee is $50 per class and is non-refundable. Please supply complete and accurate information. Before beginning to fill out this form, please make sure you have all of the following information and are prepared to make payment, as you won't be able to save an incomplete form and return later to complete it. Payments are made through paypal, although you have the option to use a credit or debit card as well. This form will accept up to six (6) classes. If you have additional entries, please use a 2nd form. IMORTANT: Please enter your email address carefully and note that all SMFA provincials information will be sent to this address. 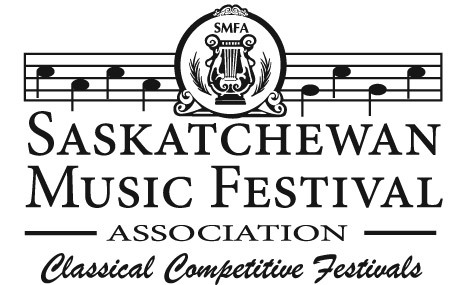 You may want to add sask.music.festival@sasktel.net and karen.smfa@sasktel.net to your safe sender lists; alternatively, plan to check your junk mail regularly. SELECTIONS - Please include movement, opus, and key in titles. If from a larger work, please list in on the "From" line. In the case of Musical Theatre repertoire, please list title of production and name of character. If you are unsure which Scholarship class you've been recommended, please click on this link SMFA Scholarship Listing. Do you have an additional class to enter? I, certify that I have read the rules, and that all conditions governing this entry form have been or will be complied with. I acknowledge that in accordance with The Electronic Information and Documents Act 2000 my electronic signature has the same effect as a signature.